Glasgow: It helps if you’ve got an uncle who can build a shooting range for you at home. Jaipur lass Apurvi Chandela benefits from this accident of fate — she’s come up through the ranks and is now a Commonwealth Games gold medallist. Jalandhar’s Rajwinder Kaur won a bronze medal in the women’s +78 kg judo competition by beating Kenyan competitor Esther Akinyi Ratugi. Rajwinder won her repechage bout against Canadian Sophie Vaillancourt by virtue of a single Wazari to set up ‘bronze date’ with Kenyan Ratugi. Vijender Singh, with his filmstar looks, stirs up interest that goes beyond the boxing ring. “Will you do more films?” a young lady, part of the Glasgow media, asks the Haryana and India superstar. She says she wants to know this due to her own personal interest, that she isn’t going to write about him being in the movies. She has been in India in the recent weeks, knows how big Bollywood is, and is curious if Vijender will make a career in the movies. IT’S not the best shooter who wins, it’s the shooter who shoots the best who wins,” Heena Sidhu, her face clouded by disappointment, her voice hurting from defeat, says. She says she’s feeling “numb”, for she’s missed a gold medal that seemed hers by rights. She, in fact, didn’t win any medal — she finished seventh among the eight finalists. Elite sportspersons who always contend for gold must believe that they’re the best – that if they play to potential, they’re unbeatable. Heena knows she’s the best among the Commonwealth shooters, perhaps the best in the whole wide world. The Indian men's hockey team defeated Scotland 6-2 in their second Pool A match at the Glasgow National Hockey Centre here Saturday. Penalty corner specialists Rupinder Pal Singh and V.R. Raghunath scored a brace each while Gurbaj Singh and Gurwinder Chandi scored a field goal each.Nicholas Parkes and Kenny Bain scored for the hosts. The Indians seldom win Test matches outside the subcontinent and when they do, these are usually resounding victories, coming after they had been trounced earlier in the series. Often, the result of the first Test is a barometer of India’ success in a series outside India. They’re poor starters. On this occasion, though, the shoe is on the other foot. Promising Punjab discus thrower Navjeet Kaur Dhillon etched her name in the history books as she became only the second Indian to win a medal at the IAAF World Junior Championships. Navjeet, the reigning inter-university champion, set a new personal record with an impressive throw of 56.36m to clinch a bronze in Eugene, USA, on Friday. It helps if you’ve got an uncle who can build a shooting range for you at home. Jaipur lass Apurvi Chandela benefits from this accident of fate — she’s come up through the ranks and is now a Commonwealth Games gold medallist. 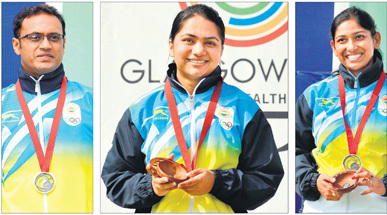 Apurvi, 21, won India their second gold medal in shooting with top-class performance in the 10m Air Rifle event. Apurvi’s total of 206.7 points was comfortably clear of the silver winner, again an Indian, Ayonika Paul (204.9 points). Apurvi had qualified fourth to the final while Ayonika had qualified in the 8th place. In the final, Apurvi began with a 31.4 in the first round of three shots to shoot into the lead. In the next eight rounds, she was never seriously threatened – her lead over the second-placed shooter was .9, 1.4, 1.4, 2.7, 2.2, 1.8, 1.5, 1.8 points after the next eight rounds. It was a comfortable win in the end. Ayonika got 102.5 points in the last five rounds of two shots each — that’s a very impressive average of over 10 points per shot for 21-year-old from Mumbai. Towards the later stages of the final, it was reduced to a contest between the two Indian. If you’re shooting 7s in the finals, you’re not going to win gold. With 10 shots to be fired, India’s Prakash Nanjappa seemed to have a grip on the 10m air pistol gold. He had 100.9 points from his first 10 shots in the final; Daniel Repacholi, with 99.6 points, was placed second. Nanjappa then suffered a disaster — he realised that he had taken too much time and had to fire his shots in a hurry. His grip on the gun wasn’t proper, yet he went ahead with the shot because of time pressure. “That was my big mistake,” Nanjappa later said. The poor shot was worth only 7.7 points; Repacholi got a below-par 9.8 but still went into the lead at 119.9 points, while Nanjappa slipped to third at 118.6. Nanjappa could have gone to pieces then, but he managed to stay calm and shoot 10.3, 9.1, 9.2, 9.6, 10.9, 10.7, 9.3 and 10.5 in his final eight shots to rise to second. He got the silver ahead of a 60-year-old granddad, Michael Gault of England. Nanjappa, from Bangalore, is a software engineer. The 38-year-old moved to Canada to work there, and that put a six-year break in his shooting career after 2003. Nanjappa was selected in the Indian team in 2003 but had to quit the sport as he joined a new job. Rahi Sarnobat won gold in women’s 25m Pistol event as she beat compatriot Anisa Sayyed by shooting a total of eight points to her opponent's mere two. Vijender himself doesn’t lack the swagger of a star; moments after beating Andrew Kometa of Kiribati, Vijender seems cool and unscathed. It was not exactly a fierce fight — Kometa is not a boxing superstar, and Kiribati is no boxing powerhouse; but for a man who’s been in a fight just seconds ago, Vijender was almost indecently blasé and cool. 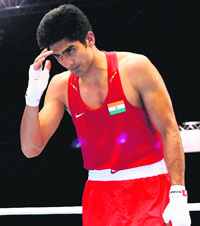 The Indian middleweight (75kg) had won the three rounds 10-9, 10-9, 10-8 – it seems close, but it really wasn’t so. Vijender didn’t really have to stretch himself too much, but he did compliment Kometa for being a “tough opponent”. He said the first opponent in any tournament is always tough; this is due to the unfamiliarity with the actual conditions at the venue, from the firmness of the ring’s floor, to the lights and visibility in the ring, to the support in the stands. Vijender didn’t lack for support here; there were Indians in the stands, and they hollered his name after he came in, went up to fight, landed his blows, and finally came off the ring and stopped for a chat with the media. A cluster of the fans gathered nearby, shouting their encouragement at him; Vijender bestowed a filmstar wave at them, and they expressed their gratitude and delight with louder shouts of “Vijender” and “Viju” and “champ”. Surprisingly, Vijender has never won a gold medal at the Commonwealth Games —he’s got a silver and a bronze, and he said he’s keen to complete the set by taking home the gold here. Someone asked him if he’s been inspired by any boxer —that’s a somewhat belated query for a boxer who’s nearly 29, and already a Olympics medallist. Vijender didn’t mind it at all and named Akhil, Ali, Aamir Khan and Oscar de la Hoya. Ali too had a rather nice face — he once declared that he was “as pretty as a girl”. Vijender wasn’t asked for his opinion of his own face, but he was asked if fighting without a helmet (according to the new boxing rules) could be harmful for his looks, now that he may have a career in the movies. “Well, it’s not easy to fight without the helmet, you get lots of cuts now,” he said. Vijender’s next few rounds are going to get tougher; luckily for him (and the rest of the field) Ireland’s Jason Quigley, who was ranked No. 2 in the world in the 75kg category, has turned pro and won’t fight amateurs any more. Quigley had beaten Vijender in last year’s World Championship. Vijender will, instead, have to contend with England’s Antony Fowler in the medals round. Fowler thinks that Vijender might be past his prime. “Singh is a good fighter… He was ranked world No.1 a few years ago,” Fowler told the local media. “He’s a little bit older than me, so he’s half coming on a bit of a down slope.” Manoj Kumar also won his bout easily. IT’S not the best shooter who wins, it’s the shooter who shoots the best who wins,” Heena Sidhu, her face clouded by disappointment, her voice hurting from defeat, says. She says she’s feeling “numb”, for she’s missed a gold medal that seemed hers by rights. She, in fact, didn’t win any medal — she finished seventh among the eight finalists. Elite sportspersons who always contend for gold must believe that they’re the best – that if they play to potential, they’re unbeatable. Heena knows she’s the best among the Commonwealth shooters, perhaps the best in the whole wide world. She’s currently the world No. 4 in the women’s 10m air pistol rankings, and not long ago she was actually the No. 1. In the Glasgow Games, Heena, a Ludhiana native, was expected to turn up, out-shoot the field with embarrassing ease, and pick up her obligatory gold. A Ludhiana girl did take home a medal in the women’s 10 air pistol event – but it wasn’t Heena, it was the 16-year-old Malaika Goel, who won silver. 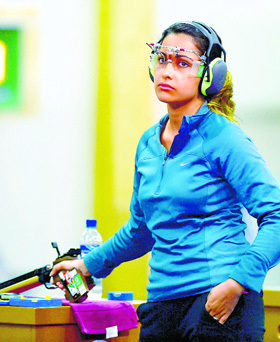 Heena had qualified for the final with the best score; she was eliminated after just 12 shots in the final – she could not contend even for the bronze. Heena knows that she shot well below potential – she’s in a daze, trying to figure out exactly what went wrong. It appears several things did. The final began five minutes earlier than scheduled, says Heena; then, the shooters’ routine was changed so that the coaches — and not the shooters — were asked to carry their gear to the shooting platform. “I was relaxing, and they announced that coaches will prepare the table (place the weapon and the gear there) and come back,” Heena says. “National coach Mohinder Lal wouldn’t know my routine, he doesn’t know what I need… I don’t train with him, so I was worried and it kept playing on my mind. I put some stuff in my pocket, the stuff I knew I must have with me. I set the table quickly, and then they started the final five minutes early!” That didn’t give her the time to tune her gun’s sights, says the 25-year-old, a qualified dentist. She says that gold should have been won by India. “It should have been between me and Malaika,” says Heena. Malaika is No. 15 in the world; she led the field for a while but, shaking with nervousness and always behind the clock with her shots, she slipped. Malaika was delighted with the silver, but she too knew that gold should have been won by India. Gold went to Singapore’s Teo Shun Xie. She’s ranked No. 70 in the world. The Indian men's hockey team defeated Scotland 6-2 in their second Pool A match at the Glasgow National Hockey Centre here Saturday. Penalty corner specialists Rupinder Pal Singh and V.R. Raghunath scored a brace each while Gurbaj Singh and Gurwinder Chandi scored a field goal each.Nicholas Parkes and Kenny Bain scored for the hosts. | Squash: Saurav Ghosal and Dipika Pallikal secured hard fought victories to reach the singles quarterfinals for the first time. Ghosal recovered from 6-7 down in the fifth to pull off a 11-2, 11-5, 4-11, 6-11, 11-8 victory Sixth seed Dipika Pallikal got past Delia Arnold of Malaysia 11-6, 12-10, 11-5. | Table tennis:The Indian women's table tennis team failed to qualify for the summit clash as they lost their semifinal 1-3 to Singapore. 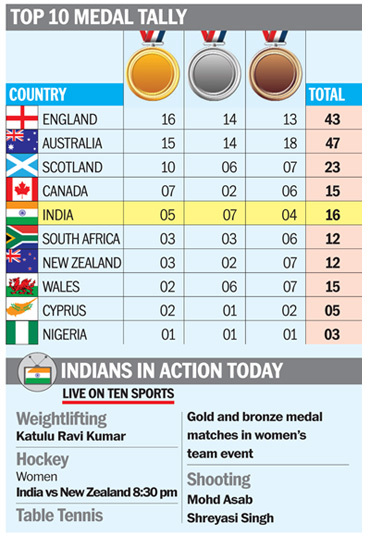 | Weightlifting: Punjab’s Meena Kumari missed the bronze in the women's 58 kg category to finish fifth. England’s Mick Gault equalled the Commonwealth Games record of 18 medals by winning bronze in the 10m air pistol competition at Carnoustie. 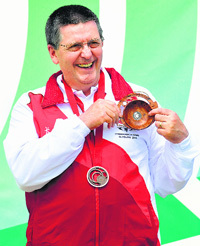 The 60-year-old, who came out of retirement to compete in his sixth Games, moved level with Australian shooter Phillip Adams, who last competed in 2002. Gault can claim the record outright in Monday’s 50m air pistol. Gault made his debut at Victoria, Canada, in 1994 and retired after Delhi 2010. The Indians seldom win Test matches outside the subcontinent and when they do, these are usually resounding victories, coming after they had been trounced earlier in the series. Often, the result of the first Test is a barometer of India’ success in a series outside India. They’re poor starters. On this occasion, though, the shoe is on the other foot. India are holding a lead; it may only be 1-0, but this hasn’t happened very often under the regime of MS Dhoni. The first time was in 2009 in New Zealand and the second time in 2011 in the West Indies. India went on to win both those series. However, it is worth noting that the team’s performance dipped in the Test matches that followed, and if it hadn’t been for an exceptional individual performance, India could have lost those series. Driving home the advantage is something Dhoni has struggled with in the past. But with a new generation of players to work with, Dhoni has a team that has no scars of earlier defeats. This could be a huge advantage. Dhoni’s captaincy in the series has been more innovative and proactive than in the past. He has been willing to experiment with bowling changes, bowling plans, team composition and various tactics right from the start, and this has helped India get the lead. Now that he finds himself in the unusual position of series leader, will he persist with his proactive captaincy or will he look to protect the lead? From the early indications down at Southampton, it seems clear that Stuart Binny will make way for Rohit Sharma. If that happens, it would suggest that the fifth bowler selection theory was a gamble and now that it has paid off, India could be thinking about showing authority with the bat. Throughout the first two Tests, Dhoni has never been short of ideas and he was almost desperate to grab the lead. He’d be at ease now, knowing his team is ahead, and his tactical changes will no more be seen as acts of desperation. It will be interesting to see which cap Dhoni wears in a situation that he hasn’t experienced for a while. The 19-year-old from Hoshiarpur produced a stunning performance at the Hayward Field after opening her series with a personal best of 54.08m. Her previous best was 53.97m which she recorded on her way to winning the Junior Federation Cup at Chennai this May. Navjeet is only the second Indian athlete after Commonwealth Games medallist Seema Antil to win a medal in the IAAF World Junior Championships. Brazil’s Izabela da Silva set a world junior leading mark of 58.03m for the gold, while American Valarie Allman (56.75m) won silver. “It’s an amazing feeling. I am very happy with what I have achieved today. I know my whole country would be proud of me. It’s the first medal for India in this event after 14 long years,” Navjeet said. Navjeet’s first major success came in Commonwealth Youth Games at Douglas (Isle of Man) in 2011 when she won a bronze with a throw of 45.27m. “I was only 12 when I developed an interest in the sport. My father was also an athlete; he represented India in many international competitions. All I had wanted was to bring a medal from the World Championships. For the last 2-3 years, I was only preparing for this event,” she told the IAAF website. In the Junior Federation Cup this year, Navjeet set a new national junior record in shot put (15.89m) besides winning a “double” through a victory in discus throw with a noteworthy 53.97m. She went on to win a bronze in shot put (14.99m) as well as a silver in discus throw (53.66m) in the Asian junior championships at Taipei in June. Perera gives Sri Lanka big lead despite Amla ton: South Africa captain Hashim Amla remained unbeaten after his 22nd Test hundred but off-spinner Dilruwan Perera’s career best figures gave Sri Lanka a big first innings lead at the end of the third day of the second Test on Saturday. South Africa were dismissed for 282 in reply to Sri Lanka’s first innings total of 421. At stumps Sri Lanka were 11 without loss, with a lead of 150. Amla put on a fine display of concentration and application as he fought hard to give his team a fighting chance of saving the Test and preserving their 1-0 lead in the two-match series. Brief scores: Sri Lanka: 421 & 11-0 v South Africa: 282 (Amla 139*; Perera 5/69).